It is not unusual to hear that the university and consultancy firms go opposite ways: for the former, spending too much time in knowledge transfer has huge costs of opportunity, for it is time not invested on publishing in impact scientific journals; for the latter, most research just cannot be easily included in the client’s bill. 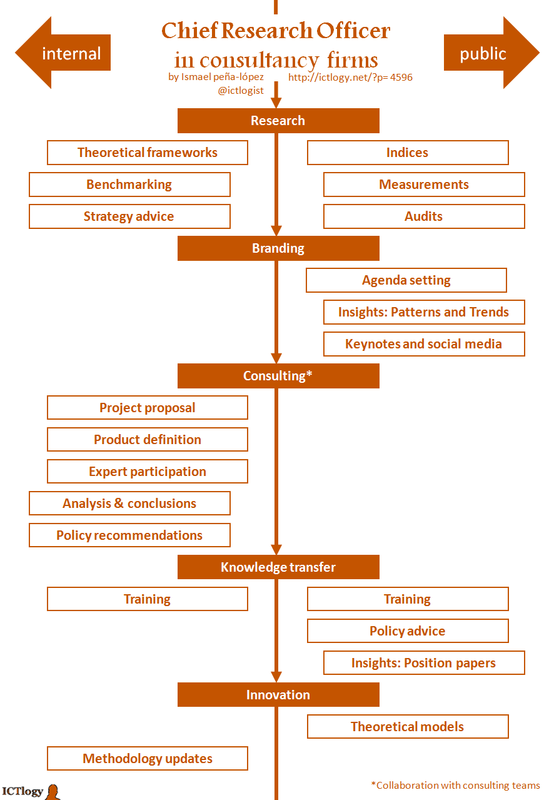 What follows is just a simple exercise on how to embed research in consultancy, so that it does not become a mere overhead but an activity that has a direct measurable impact on the value chain. The scheme presents to sets (columns) of tasks that a chief research officer —or a research office, intelligence unit or knowledge management team, etc.— can perform within a consultancy firm. On the left, we have drawn the tasks that impact the internal client and thus improve others’ activities; on the right, we have drawn the tasks that can by directly put in the market as a product or a service. Research: which stands for more basic or less applied research, and consisting in gathering information, building theoretical models and providing strategic advice to the firm. On a more public branch, it can consist on creating measuring devices such as indices or custom measurements, sometimes commercialised as ad-hoc audits. Branding: part of research is diffusion. Conveniently tailored, it can contribute to strengthen the power of a brand, contribute to create a top-of-mind brand or even, by lobbying and media placing, to have an impact in the public agenda. Consulting: the research office can work with the consulting team in some projects (especially at the first and last stages of the project) to improve its quality. Mind the (*) in consulting, meaning that the research office should not work as a consulting team: research and analysis does require some distance from the research object and, most important, different (slower) tempos than regular consulting activities have. Training: a research office that learns should teach, both to other departments of the firm or directly as a service to the clients. Providing policy advice or openly publishing position and policy papers is another way to transfer knowledge to specific clients or openly to society. Innovation: closing the virtuous circle of research, modelling and improving methodologies is a way to capitalise the investment that the firm made in a research office, thus making it more efficient and effective. Peña-López, I. (2018) “The Chief Research Officer in consultancy firms” In ICTlogy, #173, February 2018. Barcelona: ICTlogy.